Obituary – Miries, Gloria Mae (Beers) « Perry High School Alumni Association, Inc.
– 18 years old, is the daughter of Mrs. Ivy Beers, 643 1/2 Delaware street. She was born February 11, 1922 in Perry. She is an active member of the Order of Rainbow for Girls and her hobbies are music, swimming and skating. ﻿Mrs. Gloria Miries, 42, native of Perry, died Tuesday morning in San Juan hospital, Farmington, New Mexico, where she had been a patient several weeks. Funeral will be at 3 p.m. Thursday in the Basin mortuary in Farmington, N.M. Burial will be in Memorial Gardens cemetery at Farmington. She was the daughter of Mrs. Ivy Beers, 1107 Ninth street. 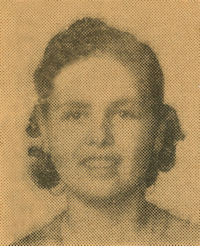 She graduated from Perry high school in 1940 and was married in Perry in 1946 to Raymond E. Miries, also of Perry. Miries is a native of Garber. The couple made their home here until about seven years ago, when he was transferred to Farmington. In addition to her husband of the home and her mother, survivors include a daughter, Karen, also of the home; a sister, Mrs. Jeanice Wade, Tucson, Ariz.; and a brother, Fred G. Beers, Perry.